For those of us who travel, our greatest nightmare is being stuck in the airport overnight, that closely followed by having to travel into O'Hare for anything. One person, who was stuck in a German airport overnight used the time to come up with an idea. An unscheduled overnight stay at a German airport inspired one business traveler, Frank Giotto, the president of Fiber Instrument Sales in Oriskany, N.Y., to create the Mini Motel, a one-person tent complete with air mattress, pillow, reading light, alarm clock and pillow (which he now sells for $39.95). 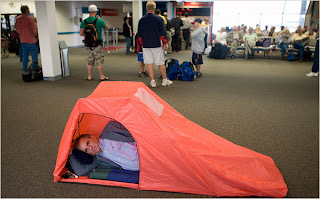 Asked what airports would think of a tent city of his Mini Motels, Mr. Giotto expressed confidence. While it certainly isn't a hotel or home, if you are stuck in the airport for 16 hours the tent, while making you feel a little ridiculous, at least will let you get some real sleep without misaligning your vertebrae on the airport seats. The inventors next project is to come up with the accompanying shower pod that connects to the sleeping compartment.